One of the best views in the city—one that rivals the Eiffel Tower in our opinion—can be seen from the peak at the Basilica of the Sacré Coeur. 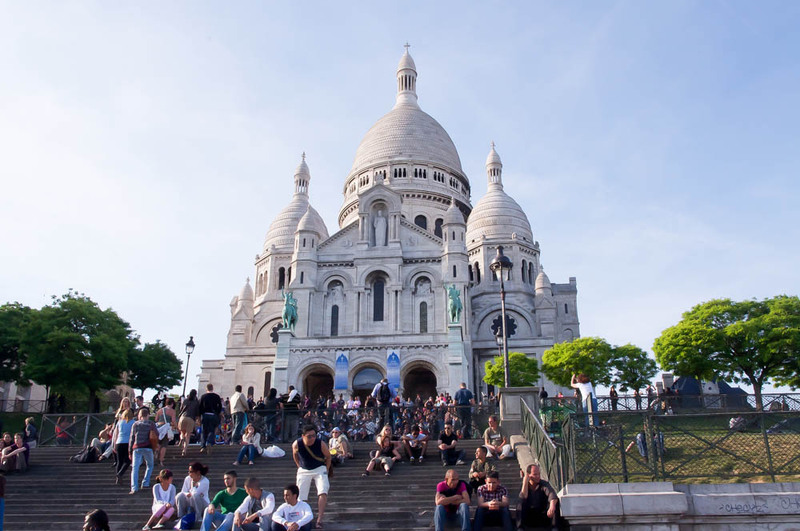 Basilica of the Sacré Coeur (which means The Basilica of the Sacred Heart of Paris) is a Roman Catholic church that also houses a minor Basilica dedicated to the Sacred heart of Jesus. Tourists and locals gather in this quiet part of the city along with artists sketching and painting the surroundings. The church is a work of art both inside and out, so it makes a great break from the busy streets below. The Montmartre neighborhood is located at the highest elevation in Paris so on a clear day you can see out over the entire city. Head inside and climb the winding stairs of the Basilica to the highest point for a killer photo op. The 18th is a neighborhood that sometimes gets overlooked, but the restaurants and bars in the area are great. Not to mention it's got some of the best underrated shopping in the city. Keep in mind that the hill is steep, and the stairs are no joke—as in, don't wear heels on this outing. If walking up the hill is out of the question there is a funicular tram that runs up the side of the hill, and you can even use a regular metro ticket. There are street vendors at the bottom of the steps, and they will be pushy trying to get you to buy their cheap tourist garbage. Just ignore them, walk away and head to the top, don't let it ruin your visit.